UWA was founded thanks largely to the vision, tenacity and financial support of Sir John Winthrop Hackett, owner and editor of a major Western Australian newspaper in the early 1900s. There was consensus among legislators of the time that the University not only be free, but also provide tertiary education of a practical nature to help develop Western Australia's pioneering economy. At the time of the University's foundation, Perth's population was just 121,000 and its economy relied mostly on agricultural, pastoral and mining industries. As a result, the founding professorial appointments were in Agriculture, Mining and Engineering, Geology, Mathematics and Physics, Chemistry, History and Economics, Biology, and English. These were balanced to an extent by the appointment of lecturers in Classics and Ancient History, French, German, Mental and Moral Philosophy, and Veterinary Science. Overarching these 12 posts were three faculties – Engineering, Science and Arts. More than 100 years later, the University is now home to four faculties, their attendant schools, and many research institutions and centres, all of which celebrated the University's Centenary in 2013. UWA also entered the internationally recognised Academic Ranking of World Universities' Top 100 listing, continuing to set the standard for other Western Australian universities to follow in terms of recognition for its achievements nationally and internationally. 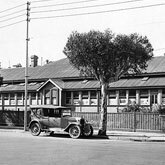 The University began operation in 1913 in a group of timber houses in Irwin Street, central Perth. In 1913, The University opened its doors to 184 students. They attended buildings with timber walls and corrugated iron roofs on a temporary site in Irwin Street, in what is now the Perth central business district. 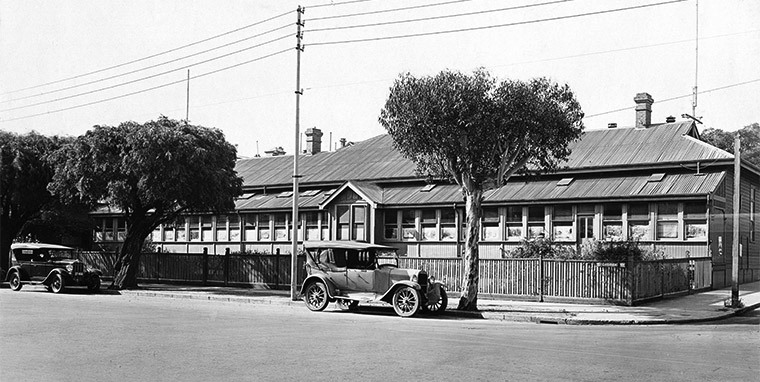 The number of buildings at Irwin Street grew slowly to accommodate more students. One structure – which accommodated the birth of the Labor Party of Western Australia – was transported from Coolgardie, 580 kilometres north-east of Perth. Overseeing the University was an 18 member University Senate, and a Vice-Chancellor appointed on a rotating basis from the professors. The Student Guild was also established as part of The University of Western Australia Act 1911 as an independent, autonomous body. High hopes for the fledgling university were put under a dark cloud in 1914 with the outbreak of the First World War. Many students and staff volunteered for military service and the local economy was hit badly, affecting its ability to fund the University. But significant milestones continued to be met with Edward Sydney Simpson (1875–1939) becoming the first student to graduate with a bachelor’s degree from UWA and the first to earn a Doctorate of Science in 1919. 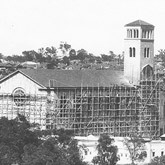 Construction of the Memorial Hackett Buildings was completed in 1932 in Crawley, about five kilometres from central Perth. Once the war ended, UWA developed quickly. Thanks to the generous bequest from Sir Winthrop Hackett's estate, building began in 1929 on a 51-hectare site in Crawley, about five kilometres west of Perth. The grand, Mediterranean-style Winthrop Hall with its imposing clock tower, Hackett Hall and administration buildings were completed in 1932. 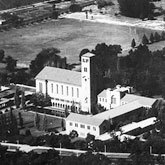 The gothic-style St Georges College – the University's first student residence – was also built with funds from the bequest and completed in 1931. The move from Irwin Street to Crawley started in 1925 and was complete by 1932. The Irwin Street buildings were moved to the current site, one of which remains in operation today accommodating the Convocation Council Room, the University's archives centre and cricket club pavilion. Using funds raised by Convocation from the University's graduates, it was fully restored and reopened in 1988 as Convocation's gift to celebrate the University's 75th anniversary, and now sits on the edge of James Oval, serving as one of the many campus landmarks. In 1927, Professor H.E. Whitfeld became the first permanent Vice-Chancellor. Law had become the University's fourth faculty in 1927 and, by 1930, student enrolments had reached more than 600. The Great Depression, beginning in 1929, and the Second World War, 1939-1945, again froze development at the University. 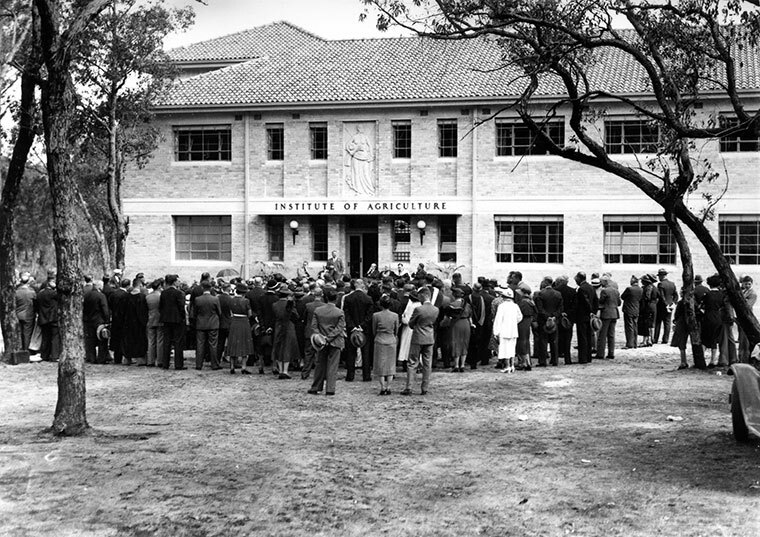 The exception was the separation of Agriculture from Science to form a new faculty in 1936. 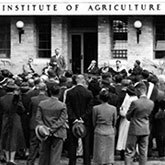 Through ties with the newly formed Institute of Agriculture, the Faculty of Agriculture was to become home to research laboratories for the Council for Scientific and Industrial Research for many years.The faculty has developed today into the best of its kind in Australia and among the top 50 in the world. Several icons of the student body were born during this period: the art magazine, Pelican, and satirical one-day student newspaper, SRUSS-SRUSS, precursor of PROSH. With the outbreak of war, the University became home to 200 US Navy personnel who served the Catalina flying base at Crawley. Shortly after the Second World War, the University started to regain momentum with student numbers reaching 1000. Unprecedented enrolment growth from the mid-1950s to the 1960s was thanks to a booming economy and a spike in demand for university education. Governments were encouraged to support the University as a better-educated workforce was seen as one of the keys to achieving industrial development. To ensure higher education was given priority, the Federal Government assumed responsibility for funding all universities. UWA finally had the money it required to fulfil its long-term objectives. The post-war baby boom had also created a larger and younger population that was enjoying a high standard of living and better secondary education. As a result, more young people were not only eligible to enter the University, but they also wanted a degree to improve their opportunities. Student numbers grew to 2000 by 1956 and almost doubled to 3800 by 1962, including 166 enrolments for master's degrees and 99 for doctorates. 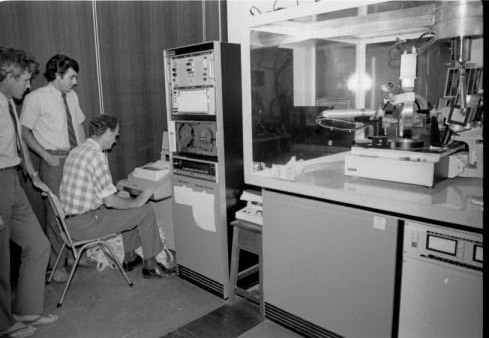 With more students came a dramatic increase in academic staff, leaping from 91 in 1953 to 247 in 1966. Education separated from Arts in 1947. Economics split from Arts in 1954. Faculty of Dentistry was created in 1946. Faculty of Medicine was founded in 1956. 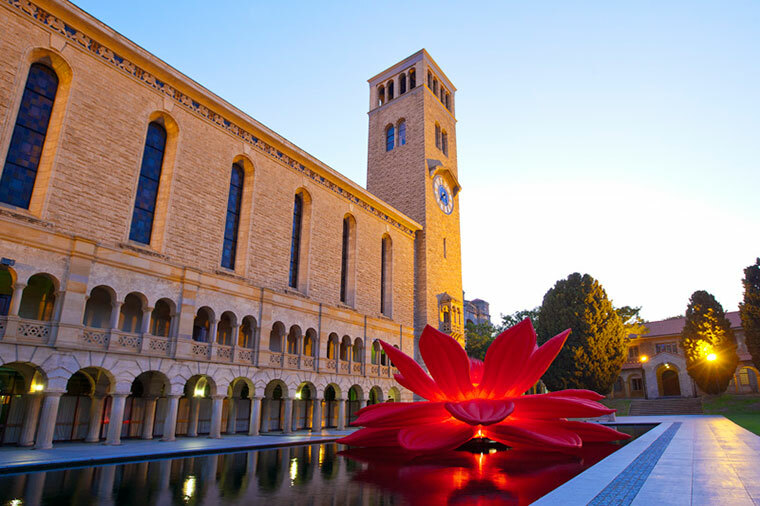 By this time, many of the University’s famous historical landmarks and artworks had established themselves as integral parts of the grounds and given the University its unique identity among West Australian sights. 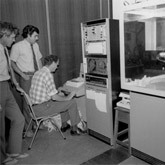 New directions in research... Doctors Ted Maslen (left), Syd Hall (middle) and Alan White helped produce advanced computer software in 1975 that analysed large amounts of data on the properties of crystalline substances. Enrolments grew to 10,195 in 1975 and started tapering off in 1976 as Commonwealth funding and student quotas were cut across Australia. 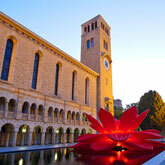 Funding for UWA was also diverted to finance UWA's first major competitor, the newly created Murdoch University. 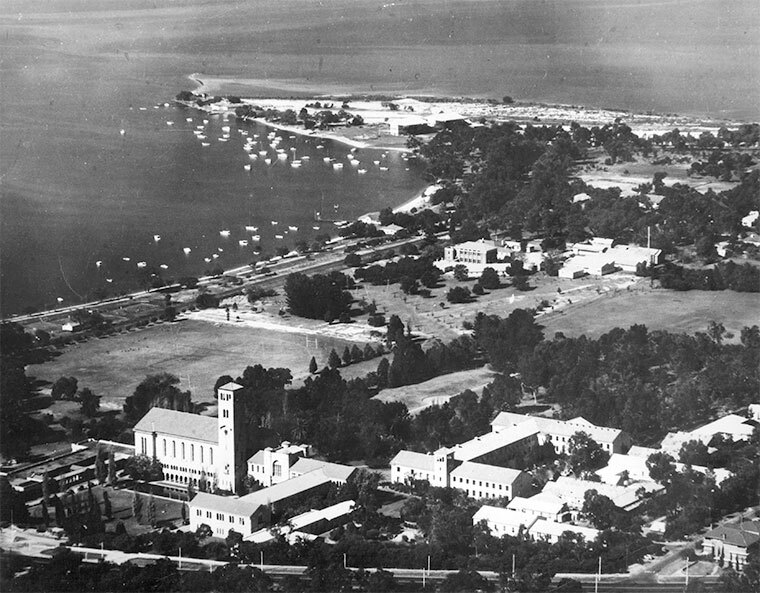 With the entry of several other tertiary institutions into Perth during the 1960s and 1970s, UWA was no longer expected to be the sole deliverer of higher education in Western Australia. Consequently, the University was able to be more specific in its goals and priorities than it had in the past. At the same time, it had to meet the changing needs of the Western Australian community, which had become more affluent and industrialised. Significant growth had also occurred in mining, commercial and financial sectors as well as the public service. Over the next two decades enrolments slowly climbed to 12,791 in 1994 and then began to increase more rapidly to 21,091 in 2009. In 2012 there were more than 24,000 students enrolled. More than 24,000 students are enrolled at the University. In 2013, a calendar of special events brought UWA staff and students, both past and present, and the wider community together on campus to celebrate 100 years of achievements. As a part of these celebrations, a detailed exploration of the history of the University was published: Seeking Wisdom, A centenary history of The University of Western Australia, edited by UWA historian Jenny Gregory. Enjoy a wonderful selection of photos which capture the celebrations of a century and view the amazing gallery of images taken during UWA’s Centenary year.